This page has helpful links and LOADS of free resources to help you plan your sixth grade year. Enjoy! My curated collection of visuals! Browse sample main lesson book pages, watercolor paintings, chalkboard drawings, etc. for Geology & Mineralogy. If you're looking for a Mineral Identification Lab Activity, I recommend this one. It accompanies this Mineral Identification Kit and has a helpful student identification "wheel" in order to decipher each mineral quickly and easily. This is designed to be significantly more user-friendly than the usual mineral properties charts. Also included is a data sheet for students to record their results. "The Castle of the Kingdom of the Stones"
CO	Roadside Geology of Colorado - Felicie Williams, et al. CT	Roadside Geology of Connecticut and Rhode Island - James Skehan, et al. DE	Roadside Geology of Maryland, Delaware, and Washington D.C. - John Means, et al. FL	Roadside Geology of Florida - Jonathan Bryan, et al. GA	Roadside Geology of Georgia - Pamela Gore, et al. IN	Roadside Geology of Indiana - Mark Camp, et al. MD	Roadside Geology of Maryland, Delaware, and Washington D.C. - John Means, et al. MS	Roadside Geology of Mississippi - Stan Galicki, et al. MT	Roadside Geology of Montana - David Alt, et al. NE	Roadside Geology of Nebraska - Harmon Maher, et al. RI	Roadside Geology of Connecticut and Rhode Island - James Skehan, et al. UT	Roadside Geology of Utah - Felicie Williams, et al. WI	Roadside Geology of Wisconsin - Robert Dott, et al. WY	Roadside Geology of Wyoming - David Lageson, et al. I am currently teaching this main lesson block, in January-February 2017. When we are done I will create a blog post with photographs of all of Becca's MLB pages. Note: I ended up adding an extra week to this main lesson block, so we had plenty of time to explore the topics and add in field trip opportunities. I'm not usually one to spend extra time -- I keep pretty tightly to my schedule and the school year plan -- so this was something special! A good poem to memorize for this block is "Flint" by Christina Rossetti, page 2017 of The Hutchinson Treasury of Children's Poetry. You could use the full-size tapestry loom we had, or do this project on a smaller scale with a lap loom. My favorite warp is Glimakra Linen Rug Warp, and we use wooden yarn needles. MLB illustration - The Circle of Fire FREE sample lesson from Live Education! 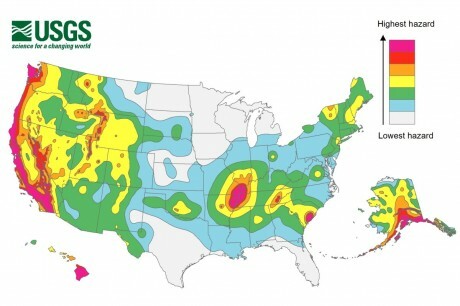 "USGS Increases Earthquake Risk Along New Madrid Fault"
Volcano Painting - Explosive Art! limestone cycle lesson from Live Ed! one of my favorite handwork projects: wet felted geodes! When our tapestry was finally complete (it's a year-long project), we exhibited it at the County Fair. February 12, 2017 -- we warped our loom and started a new Earth Science tapestry, inspired by the "landscape framed by a limestone cave entrance" lesson in Painting and Drawing in Waldorf Schools: Classes 1-8 by Thomas Wildgruber (pp.260-261). My children are so excited to begin!!! November 19, 2017 -- we have learned that stalactites and stalagmites are best made by finger knitting lengths of yarn (preferably cotton), which gives the correct texture, and put in place before the background is woven in. When you are weaving, simply pass behind the existing stalactites and stalagmites. This will make them stick out from the background, adding additional texture.